Manu was the last M-class to be built by Arch Logan (he built M-1 Mawhiti, now on display in the ANMM, and M-3 Matarere, both in 1922; M-4 Maroro 1924, M-6 Manene 1925 and M-9 Manu 1929). She was known as Manu, but registered as Manu II because there was a launch named Manu already registered at that time. Manu won a number of Squadron championships and by 1938 she was the top M on the harbour. 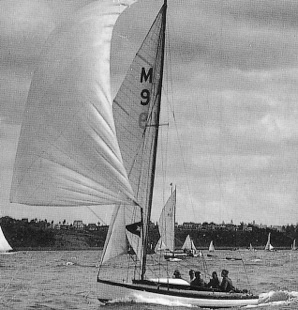 In 1939 Manu won the "Worlds 18-footers Championship Trophy", (today popularly known as the J.J. Giltinan Trophy), defeating the best of the Aussie 18's and at the same time was crowned 18-foot Champion of New Zealand. The trophy for the latter, a beautiful inlaid tray of Native woods of an M-class under sail, is kept at RAYC. The fall out from her 1939 victory had enormous repercussions in the NZ centreboard world and led to several dramatic changes in the way Auckland yachting developed. 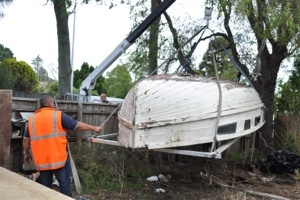 So appalled by the affair was her skipper Gordon Chamberlin, that he put Manu back in the shed on Ponui Island and never sailed her again. In the 1950's however, those intrepid Brooke brothers rescued her and raced her for a season or so. After a couple of appearances in the early 1960's she slipped from view.